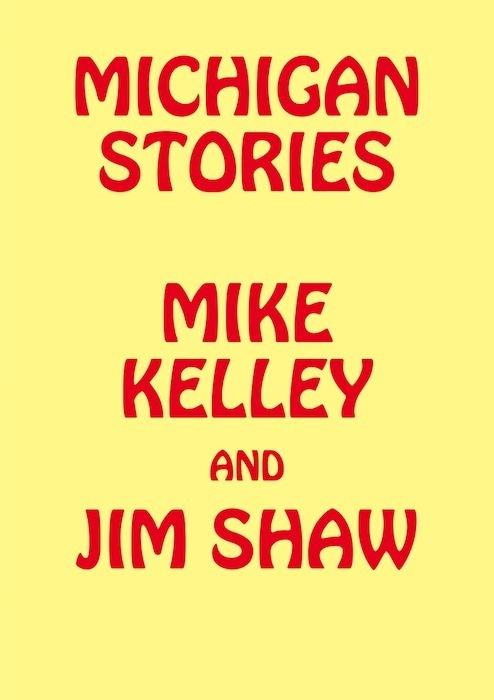 This long overdue publication tells the story of artists Mike Kelley (1954–2012) and Jim Shaw (b. 1952), who shared a lifelong friendship and common background: an upbringing and education in the State of Michigan. Published on the occasion of the major exhibition of the same title, this catalogue is the first to place these artists’ practices alongside each other in historical context, approaching their work as parallel visual meditations on Midwestern culture in particular and on American culture more broadly. The catalogue begins with their meeting at the University of Michigan in Ann Arbor and early collaborations, including the formation of the collective Destroy All Monsters. Branching out from there, major bodies of work from each artist are presented with a specific interest in tracing the lines of influence as rooted in the vernacular visual cultures of Michigan and the Midwest. Illustrations of the artists’ source material, their individual works, and installation views from the exhibition feature prominently throughout the publication, offering readers new perspectives on the work of these seminal artists. Essays by exhibition cocurators Marc-Olivier Wahler, Carla Acevedo-Yates, and Steven L. Bridges also unpack the many narratives layered in the exhibition, including an interview with Jim Shaw. MARC-OLIVIER WAHLER is Director of the Eli and Edythe Broad Art Museum at Michigan State University. CARLA ACEVEDO-YATES is Associate Curator at the Eli and Edythe Broad Art Museum at Michigan State University. STEVEN L. BRIDGES is Associate Curator at the Eli and Edythe Broad Art Museum at Michigan State University.